MAASAI .......... One of my personal highlights was seeing (and photographing) the Maasai people. My driver knew I wanted to photograph the boys who had just finished their circumcision rites as a passage into manhood. 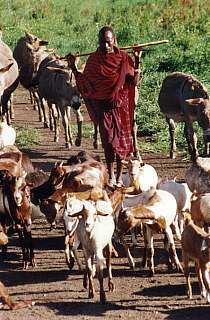 Maasai usually wore red clothing. These boys, however, were dressed in black, their faces painted white. When we passed a group lingering on the side of the road to earn some tourist dollars, there was no way we were not going to stop. Later we visited a Maasai boma (village). It cost $25.00 for the three of us in the van to enter the boma. Yes, it was a very touristy experience. Yes, I would rather have entered a village where people didn't want to sell souvenirs. Yes, I would have preferred to go unnoticed. However, that wasn't going to happen in this corner of the world. But, after paying, I could take all the photos I wanted. And I wanted! I shot up almost an entire roll of film. How could I stop? The Maasai women wore such intricate beadwork jewelry while the Maasai men elongated their earlobes. There were so many portraits that had to be taken - and then eventually drawn! Copyright 2001 by Phillip Martin All rights reserved.